If you’ve ever said, “I could have done it so much better!” after walking out of the latest studio-produced assault on your humanity, you now have no more excuses. The 48 Hour Film Project Praha, which will open early registration on August 1 for the October 2013 season, is an annual event that appeals to arm-chair critics—at least those adept at understanding and creating media at a frenetic pace. 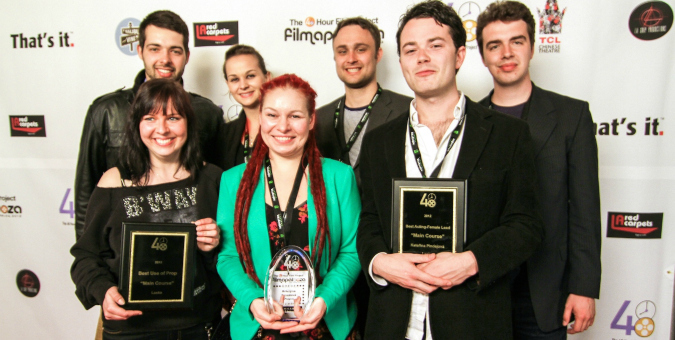 The 48 Hour Film Project (48 HFP) is the world’s largest timed filmmaking competition. Filmmakers have 48 hours to make a 4-7 minute film based on a given prop, character, and line of dialogue. Participants make the film in one weekend and less than a week later it is screened for a panel of judges. The concept came about in 2001, the brainchild of Washington, D.C. filmmaker Mark Ruppert. Since that first competition, over 300,000 people have participated in the filmmaking event, which now takes place every year at over 100 cities worldwide. Participating Prague filmmakers will compete with contemporaries in New York, Ho Chi Minh City, Johannesburg, Paris, Tel Aviv, Los Angeles, Melbourne, Shanghai, Mumbai, and beyond, with the winning team representing their film at the international Filmapalooza competition. Filmapalooza 2014 will be held in New Orleans, where the best international films of 2013 will be screened. There, the 125 city winners from around the globe will be chosen from over 4,000 films. Local kick-off takes place on Friday evening of the 48 HFP weekend, where filmmakers gather for the announcement of the required elements at 19:00. The teams then pick a genre, which can range from drama to horror to mockumentary, sci-fi, superhero, or even a western. The full list of possible genres can be found here. As they are trying to write the script, filmmakers must assemble their cast and crew, track down equipment, locations, and anything else necessary to make their movie. The resulting films—which are amazingly varied, limited only by the imaginations of their creators—are screened October 11-12 to at Kino Lucerna, one of the longest running cinemas in Europe. An award ceremony will follow the last screening. The competition will be judged by professionals from the business and film community and Czech celebrities. One of the judges for this year is famed film director David Ondříček, who made last year’s Czech Lion winning In the Shadow. Other jury members will include PhDr. Nora Dolanská, MBA, the director of Prague Welcome, as well as Julio Wallovits, the Executive Creative Director of the advertising firm Lowe and Partners, and Jana Kubíčková, local acquisitions manager for TV Nova. Pivoňka’s film was chosen as one of the best in the world, winning two prestigious awards at Filmapalooza, including the prize for Best Acting by a Female Lead (Katerina Pindejovà) and best use of prop. “Main Course was one of the strongest films we’ve seen over the years,” said Liz Langston, one of the founders of the 48 Hour Film Project. The film was chosen to screen at this year’s Cannes Film Festival as well as the Albuquerque Film & Media Experience in New Mexico. This success follows on the heels of No Country for Young Men, the winning Czech film from 2012, which was directed by Robin Kvapil and produced by Tomáš Měsťan. Their film also went far in the international competition, screening in a special presentation at NAB Show, an annual film and tv trade in Las Vegas. In my personal experience as a veteran filmmaker in the Los Angeles 48 HFP, one of the best things about the weekend is the camaraderie it engenders. It’s a fun and sleepless experience and the key to making a great film is to find a way for all the people on your team to gel. It’s a bit like going into battle, and if you don’t stay focused on the goal, you’ll end up one of those poor teams that hang by the dropoff location minutes before deadline on a Sunday night, cursing and waiting for their film to digitize out of Final Cut. View this video clip to see how the 48 HFP works around the world; here’s a trailer from last year’s Prague competition. Not a filmmaker? The 2013 48 HFP will hold workshops, evenings with film legends, and a party at Chapeau Rouge for film enthusiasts. Paul is a writer and filmmaker. He splits his time between projects in the US and Czech Republic, where he co-produces the 48 Hour Film Project. Paul writes about culture, film, and technology.